Sucu Mate – Born Dead (2016) is the result of an extended investigative process into the Old Balawa Estate Cemetery, a cemetery with a history of slavery in the Pacific island nation of Fiji. Luke Willis Thompson applied for custodial rights to a small selection of gravestones within the racially zoned site. In 2015, official approval was given to the artist from Fiji’s governing institutions to excavate anonymous material from the worker’s section, itself a former sugarcane plantation. 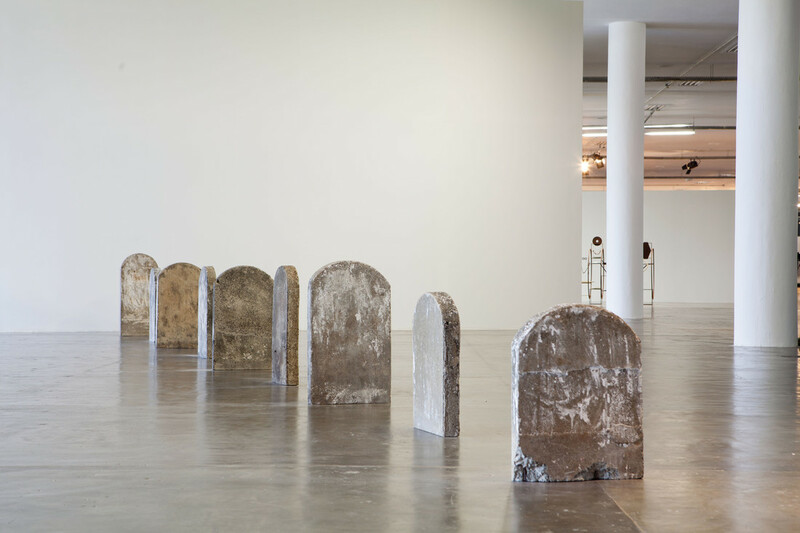 The concrete markers were permitted to travel out of Fiji for a period of 24 months to be exhibited as art objects, and are presented here after being shown in Auckland and Brisbane. The work is, in this way, a mobile cemetery, and one that questions how human lives and dead bodies are inscribed in the order of power. The project will continue with the gravemarkers’ repatriation to Fiji and resituated within the same field from which they came. In such a way the project simultaneously prototypes both a historical continutiy and the performance of dislocation; two cultural operations with national relevance as the islands within Fiji face ecological change and the continuing submergence of their lowlands.